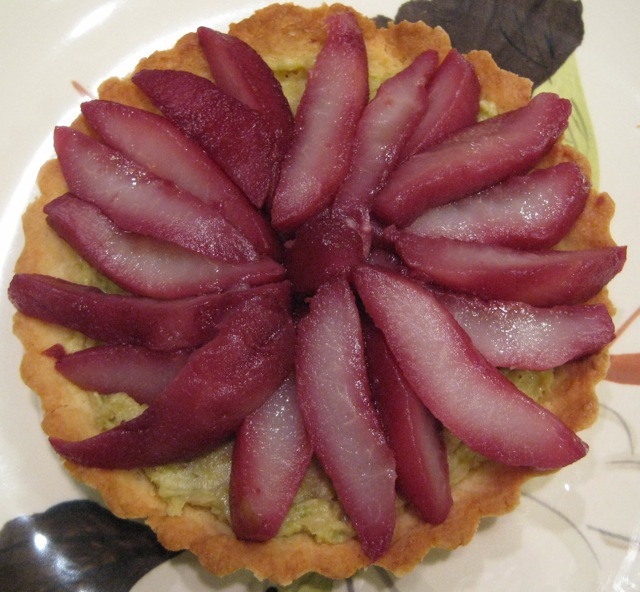 This week, the Tuesdays with Dorie group baked the very sophisticated Rosy Poached Pear and Pistachio Tart. Thank you Lauren of I’ll Eat You for this selection; check her blog for the recipe or look on page 370 of Baking: From My Home to Yours. What you’re looking at is a crust made with Dorie Greenspan’s Sweet Tart Dough, topped with pistachio pastry cream and pears poached in wine, sugar, and lemon and orange zest. The sauce is a reduction of the poaching liquid with some honey. Fancy! I didn’t make any changes to the recipe, but I did split up the work over a couple of days. Day 1 I mixed the crust and put it in the freezer and made the pistachio pastry cream. Day 2 I baked the crust, poached the pears, made the caramelized pistachios, and made the sauce (and assembled and ate it!). How it went: There were a lot of parts to this, but they all went smoothly. I’ve made the crust a few times and it’s always worked out great. Pastry cream: Unfortunately, I couldn’t find shelled, unsalted pistachios, so I ended up with shelled, salted nuts. I removed them from the shells and rubbed them between my fingers to peel of the skins as well as I could. I also rinsed them to try to remove some of the salt. I was relieved when I tasted the pastry cream and it wasn’t salty. I decided to strain the pastry cream because I don’t like the grainy texture from finely ground nuts. Caramelized pistachios: I was nervous going into this one, but it was easy and they turned out great. Sauce: I figured I’d make the sauce since I hated to throw away the poaching liquid. How it tasted: In a word, good! I was a little skeptical of the pears poached in wine, but they not only look pretty, they taste good. Not super-sweet, but also not boozy. All of the components were delicious and they were all delicious together. The caramelized pistachios are so good I could eat them by the handful! My husband liked this a lot, and really enjoyed the combination of textures. He declared this a “high brow” dessert. 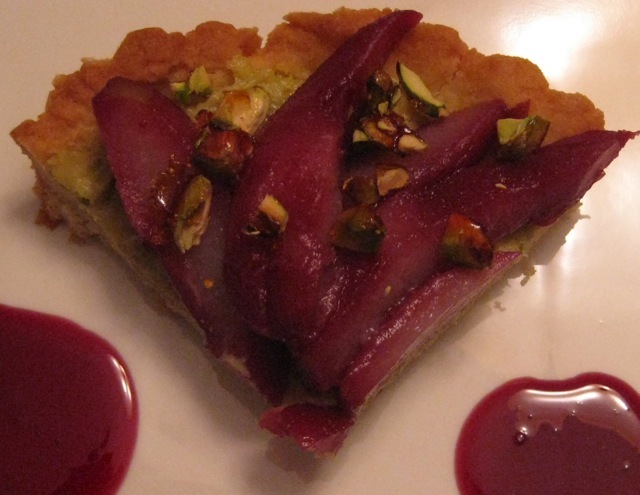 I did put the pistachios on the tart, but they didn’t make it into the photos above. Here they are for proof! Would I make this again? : Maybe. I say maybe only because there were a lot of steps to put this together, so it’s probably not something I’d throw together for the two of us to munch on. But if I have occasion to make a beautiful, sophisticated, delicious dessert, this is a strong contender! PS: I had some poached pears left over, so I ate them with plain yogurt and put a little of the sauce on top. Delicious! Ciao ! You are right the pears are very nice even alone ! Your tart is fabulous !! My husband declared this the perfect dessert for a ladies luncheon. Hm-m-m. His thinking seems to be close to your husbands. It was fun to make….once. 🙂 I like the dark color of your pears. Very nice! Simply lovely Jill, simply lovely… the wine seem to have gone so deep into the pears flesh! WOW! Your tart looks beautiful! I agree that this was a fancy, upscale dessert!! I love how red your pears got! I had a lot of fun making this one!! Your tart is absolutely beautiful! I love the color of your pears. Love your presentation, with those little drops of sauce. Gorgeous! That really looks great! Love your photos. It urned out great Jill! I’m with you – looks pretty tasted great, but a lot of work! I made the sauce too – you’ve just reminded me, I should use it up on icecream. Your photos are beautiful. I am sorry I didn’t make this one but just didn’t have all the ingredients. But, I will make it and soon. Beautiful tart and stunning presentation! I loved the candied pistachios too, I was happy I made more than I needed for my little tart (and how great that that part was surprisingly easy). Beautiful tart. I really love the color your pears turned. The candied nuts are so delicious and easy! A lovely tart! It’s so well arranged. Agree with you about it being a lot of work. Your tart is lovely. You did an amazing job!!!!! Looks beautiful. That first picture is so creative. Wow Jill! 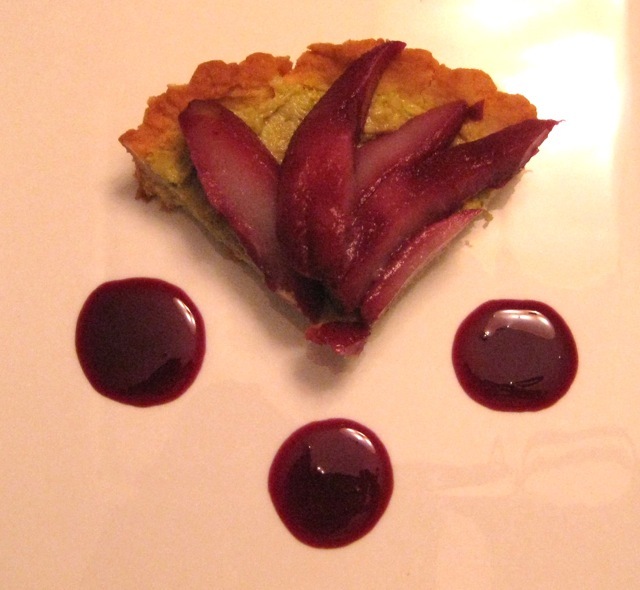 You did a fabulous job with this tart and your presentation is just amazing. Such rich colour! Very beautiful. I’m glad you enjoyed the tart, but it certainly was a big project. Glad to know that the poached pears weren’t too boozy. I might try them that way if I ever make this again. Yours is beautiful…I should have made it.